Indian, Portuguese, British, and German influences all add a hint of the exotic to the culinary flavors of Tanzania, in addition to the over 120 ethnic tribes that have lived in the country for hundreds of years. Age old African traditional cooking and European flair blend together beautifully to create a unique East African journey through texture and taste that avid foodies just have to try. Here are some of the most memorable and unusual Tanzanian delicacies. Can’t find the dinner cutlery? Before getting to the food itself, travelers should be aware that knives and forks don’t feature very prominently at a traditional Tanzanian dinner table. Locals usually eat from a communal dish or dishes, scooping handfuls onto their plates and mopping up sauces with various local breads. It is perfectly acceptable to eat with your fingers and there will always be a water bowl nearby to wash your hands before you dine. The right hand is used to eat, as the left is considered unclean, and traditionally Tanzanians eat sitting on the floor or at a low table. Monsoon is one of the most popular restaurants on the island of Zanzibar and serves up traditional Swahili flavors with a flair. Floor cushion dining is accompanied by gorgeous, colorful décor, as well as live Taraab music to really set the island scene. 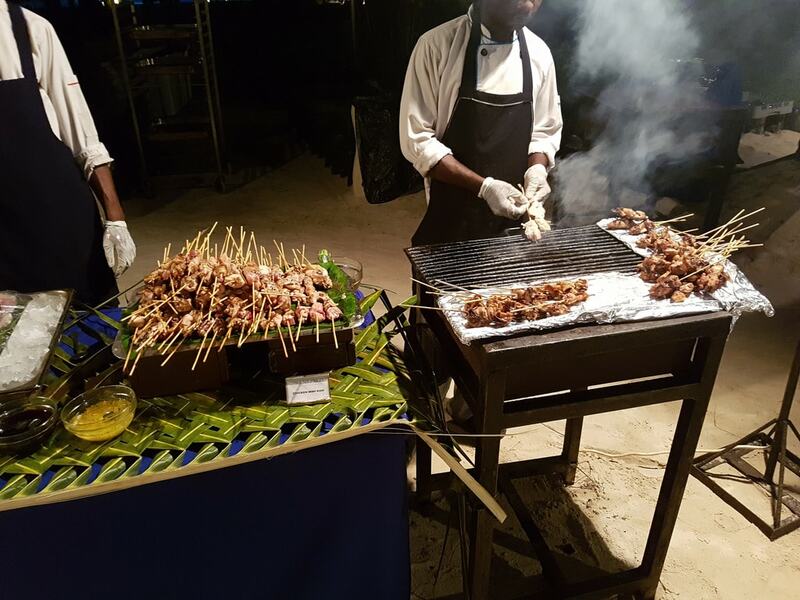 Dishes for foodies to try include delicacies such as tasty kebabs served with a mango and papaya salsa, and tender octopus cooked in coconut sauce. Don’t miss out on the cocktails for a perfect night out. Ugali is considered the national dish of Tanzania and accompanies just about every meal, served alongside meat, fish, veggies, and even beans and sauce. For those not accustomed to eating with their hands, it makes things easier, as the dough can be rolled into a round shape and used to scoop up sauce and other little bits and pieces on a plate. The dough is made from cornflour and water and usually has a thick consistency. It is typically eaten from a bowl shared by everyone at the table. This is one of the most traditional and delicious meals served in Tanzania and combines the locally grown and easily found ingredients of spinach, tomatoes, onion, and sweet potato leaves. All that is needed is a large pot to cook up the ingredients before adding some peanut butter to create a smooth cream sauce. Makubi is also thought to have health benefits, so there’s a double bonus on the culinary front. Meat-loving foodies can spend hours in culinary heaven as they roam the food markets of Tanzania. One of the most popular street foods is nyama choma which loosely translates to “grilled meat.” It is prepared by taking freshly cut cubes of meat and slow roasting them on a grid over hot coals. Be warned that the meat is not always fish or chicken, but could also be goat. Often these skewers of succulent, char-grilled meat are served with ugali and a variety of other side dishes. Foodies shouldn’t miss a visit to the Forodhani Gardens in Zanzibar, one of the most popular food markets on the island. This side dish consists of beans or rice and is usually eaten with meat. Although it may sound pretty normal, it is the infusion of aromatic East African spices that turns it into something special. Cinnamon, cardamom, and cumin seeds add an exotic element, while the rice or beans are cooked in coconut milk or oil, enhancing and enriching the flavors. This dish is one of the more expensive traditional meals on offer in Tanzania but is packed with flavorful and healthy ingredients. Literally translated, it means “something that is boiled,” but this is no bland, overcooked offering. The specialty dish begins with fish or meat to which a host of other ingredients are added, such as carrots, potatoes, aubergine, cabbage, onions, plantain, peppers, and spices. The large number of elements used in mchemsho accounts for its hefty price tag, but the extra money is worth it. Chapati is a great accompaniment to any meal and is similar to Indian flatbread or roti, in that it is made using no yeast or baking powder. The unleavened bread is fabulous with curries and stews and is also one of those side dishes that comes in handy when cutlery is not around. Simply tear off pieces to scoop up food and mop sauces off the plate. Perfect for rounding off a meal without too much sweetness, the East African donut, or mandazi, is a form of fried coconut bread that has a lovely light and fluffy texture and is usually served in a triangle shape. Unlike donuts of the western world, these little treats don’t come layered in icing or sugar so you won’t feel too guilty popping one more into your mouth. Tea was originally introduced to Tanzania hundreds of years ago by the British, and today the country is one of the largest tea producers in the world. It will come as no surprise then that Tanzanians take their tea drinking rather seriously and numerous tea rooms can be found around the bigger towns. Try the Akberali Tea Room in Dar es Salaam, a great little local hangout that serves a variety of East African specialties.